Set your Stop Loss. Use 0 (zero) if you don't like to use Stop Loss ( not recommended ). Set your Take Profit. Use 0 (zero) if you like to use open target. Set the Trailing Stop. Use 0 (zero) if you don't use trailing stop feature. 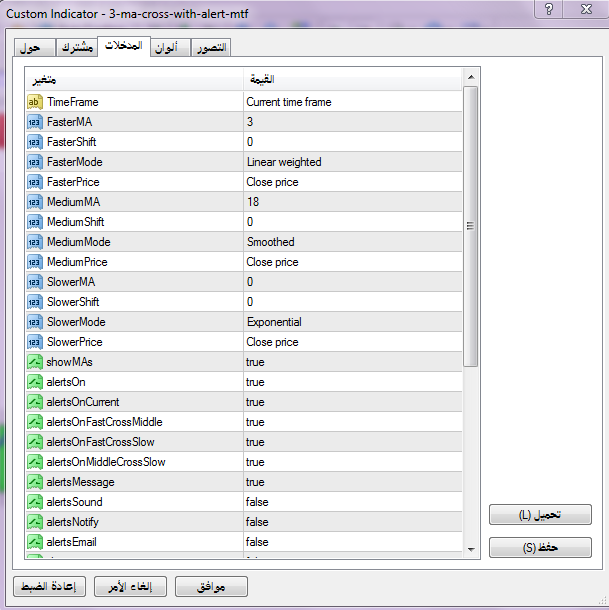 Set the pip distance between FastMA and SlowMA to be consider as a valid cross. Use 0 (zero) to disable this filter. Set number of bar after the cross to keep checking on the entry condition in regards with the minimum distance between FastMA and SlowMA. Need MinCrosDistance > 0 to enable this feature. Use 0 (zero) to disable this feature. If set to TRUE, will exit any trade and reverse position when signal change. If set to TRUE, will use no Stop Loss - Take Profit - and Trailing Stop. This is always in play setting. If set to TRUE, will exit any trade if there is an opposite cross without consider any additional filter. So exit purely **** on moving average cross. If set to TRUE (and UseCounterTrend = FALSE), will only trade according to ThirdMA direction, above for BUY and below for SELL. If set to TRUE will keep trade even if counter ThirdMA direction, but with different StopLoss and TakeProfit. Need UseThirdMA = TRUE to enable this feature. If set to TRUE will set the EA only to trade counter trend trade, mean BUY if cross below ThirdMA and SELL if cross above ThirdMA. Need UseCounterTrend = TRUE to enable this feature. Set your Stop Loss for CounterTrend trade. Use 0 (zero) if you don't like to use Stop Loss ( not recommended ). Set your Take Profit for CounterTrend trade. Use 0 (zero) if you like to use open target. Set to true if you like to filter the trade, only BUY if the cross of Slow and Fast MA occur between S1 and S2 and only SELL if the cross of Slow and Fast MA occur between R1 and R2. Set TRUE to reverse the entry condition. If set to TRUE, will enter/exit trade on the next bar after the cross confirmed. If set to FALSE, will enter/exit trade as soon as there is a cross. If set to TRUE, will only trade once on one bar. If set to FALSE, will trade more than once on one bar if the entry condition is still valid, although still one trade at a time. Number of try if the order rejected by the system. Use to generate Magic Number. Change this number ONLY if you like to run the EA on same pair and same time frame but with different setting. Number of maximum open trade at one time. This setting is use when StopAndReverse / PureSAR = FALSE so the EA won't close the open order when there is an opposite signal, but rather it will open a new trade. Set the number of open trade allowed. If StopAndReverse / PureSAR = TRUE this setting will always = 1, mean one trade at a time. If multiple open trade enable (by set MaxOpenOrder>1 and OneEntryPerBar=FALSE) this number will determine the minimum distance between each trade on same direction. If set to TRUE, the EA only active on certain time. Time when the EA start active (use with UseHourTrade = TRUE). Time when the EA stop active (use with UseHourTrade = TRUE). Number of lot per trade. If set to TRUE, will use build in money management. If using Micro Account set this to TRUE. Use with MM = TRUE to set the risk per trade. Will sound an alert when there is a moving average cross, cross UP or cross DOWN. The filename for the alert. Print some comment on backtesting. Show setting on the chart. - add immediate trailing stop. - add MinPriceDistance for multiple open trade. - add MaxLookUp feature to keep checking on the entry after certain bar from the cross regarding the MinCrossDistance. - add OnlyCounterTrend feature if using ThirdMA filter.